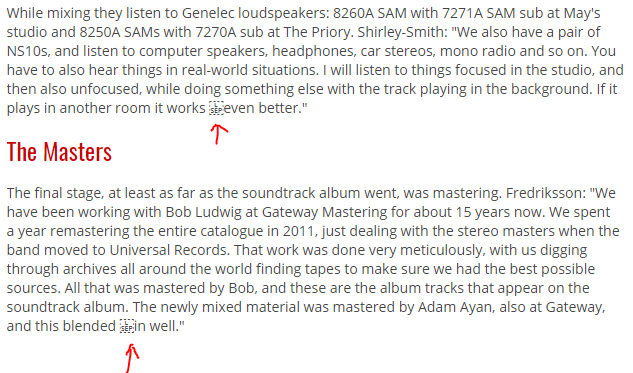 Reading through the Queen soundtrack article (https://www.soundonsound.com/techniques ... soundtrack), I noticed that each of the two paragraphs immediately preceding and following the subheading "The Masters" have a stray non-printable 'Left Separator' character that appear as box icons in Chrome. "works even better" and "blended in well." No issues for me in Firefox. Eddy Deegan wrote: ...that appear as box icons in Chrome. I'm using Chrome (v73.0.3683.103 Official Build 64-bit) on Win 7 and it looks fine to me. Can you be more specific about your browser and OS, please? I think I also noticed a colon that should have been a semi-colon...? Interesting! I'm running Chrome 73.0.3683.103 (Official Build) (64-bit) on Windows 10. In Firefox they do not appear for me, so it seems to be a Chrome thing. If I 'view source' on the page in Chrome, they appear as character literals in exactly the same way as shown in the screenshot above. If I enter dev tools then I can edit them out. They are a distinct character that occurs between the space preceding the words 'in' and 'even' and the words themselves. ...actually I love this kind of thing....lots of people up in arms about it all over the Internet. Rogue spaces at the end of a line can apparently cause this anomaly...? I'm guessing this is related - seems to have been around for a while though I've not noticed it on any other articles as far as I recall. Don't use chrome, but I wonder if when concatenating lines it is treating a space + EOL as a unicode character. Bad programming anyway. So it does look like a bug in Chrome to do with misinterpreting a specific combination of something as the Unicode Line Separator character. That character is U+2028 Line Separator, which is a kind of newline character. Think of it as the Unicode equivalent of HTML’s <br>. 3) You have a font installed that displays LSEP as a printing character that only Chrome detects. To figure out which font it is, right click on the offending text and click “Inspect”, then switch to the “Computed” tab on the right-hand panel. At the very bottom you should see a section labeled “Rendered Fonts” which will help you locate the offending font. There were indeed 2 spurious space characters that were not HTML but leftover from the XML export from the InDesign layout. I have a script that searches and destroys them, but I must have run it when my cursor was already positioned lower down the main text and not at the top. Apologies, I'll drag the hair shirt out of the closet and wear it all night in shame.